Picking up a year after the ending of Arlene Hutton’s critically acclaimed Last Train to Nibroc, this tender and funny sequel follows May and Raleigh through the end of World War II and introduces the characters of their two mothers-in-law. A medical condition keeps Raleigh from military service, and he is forced to sit idly on the porch, watching the cars drive by, as May supports them both as a high-school principal. Faced with daily rejection letters for his writing, constant criticism from his mother and taunts of cowardice from townspeople, Raleigh fights to find meaning in his new life. When tragedy strikes the family and May loses her job to returning soldiers, she discovers she must make an unimaginable sacrifice to save her relationship with Raleigh. This tender portrayal of married life, set against the backdrop of World War II, shows the best of the human spirit and its ability to overcome any and all obstacles. 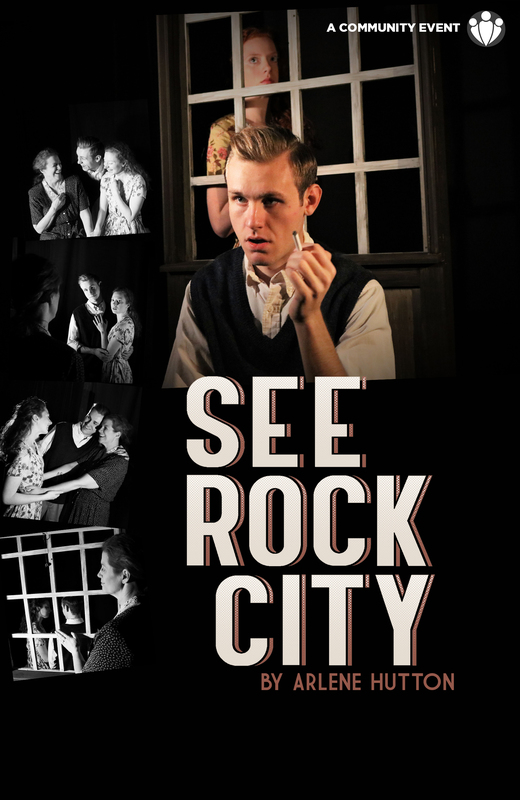 Tickets to SEE ROCK CITY are a $10 donation at the door only the day of the performance. Credit cards will be accepted.